Looking to create "authentic musical instrument store"
"You want a Flying V with that X-Files DVD?" Used to be US consumers went to Best Buy to pick up TVs, computers, DVDs, iPods and the like. Now they'll be able to nab that Strat or Les Paul they've always lusted after. 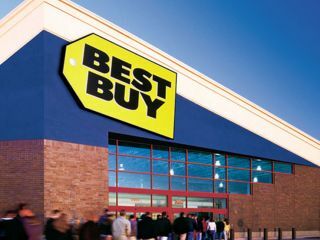 In an announcement to be made today, Best Buy Inc., the largest consumer electronics retailer in the US, will announce that it plans to open as many as 85 "musical instrument centers" inside its stores by the end of the year, and could add even more locations in the future. Each site will use about 2,500 square feet of retail space and include roughly 1,000 different products with well-known brand names such as Fender, Gibson, Drum Workshop and Roland. "We're not just extending the shelf space in the store, we're creating a designated area specifically for this experience," said Kevin Balon, the company's vice president of musical instruments. "And we're trying to create an authentic and genuine musical instrument store look and feel inside of Best Buy." The Richfield, Minnesota-based retailer - already an industry leader in sales of everything from digital cameras to video games - will use its headfirst jump into the $8 billion US musical instrument market to carve out new revenue opportunities as sales of CDs and DVDs slow. When the rollout is complete, Best Buy will become the second-largest instrument seller in the country based on locations. So far, ten sites are already open, including five in California, two in Illinois and two in Minnesota. Best Buy's selection will include everything from accessories to high-end basses, guitars, drums, keyboards and DJ equipment. Instruments will be housed in separate rooms and the company also plans to offer group music lessons. So next time daddy goes out to buy the kids that copy of Shrek III, don't be surprised when he also comes home with a 16-piece drum set.